I don't have any real previous feelings toward the character of Sherlock Holmes. I think my biggest exposure to him was in Steven Spielberg's Young Sherlock Holmes, but it has been quite a long time since I've seen that. I seem to remember reading a Stephen King short story about Holmes, but I don't remember which collection that was in or whether I liked it or not. The biggest complaint I've heard about the new Sherlock Holmes is that it turns Holmes into an action hero. I'm going to mildly disagree with even that notion. Allow me first to acknowledge that yes, there is probably more action than Doyle meant Holmes to have. But I liked the "thinking" part of his fighting. If you haven't seen it yet, this paragraph might be a mild spoiler, but not for story. As Holmes fights, he thinks through each move he is going to make. You "hear" his analysis of each punch, kick, or block before he makes it. The idea reads as very cheesy. It felt a bit like something the Terminator would do. Think about the scene in Terminator 2 when Arnold is analyzing how to take out the police force without killing any of them. But you know what? I bought it. It worked for me. Surprisingly enough, I liked this use of slow motion. But it also worked to make Holmes a thinker all the way through, which is necessary for him. The rest of the action didn't take up too much of the movie, I thought. I don't think I would be willing to defend it too much beyond that, however. If one were to argue that it amounted to dumbing down the movie to make it more accessible to mass audiences, I would agree. Do we want to dumb down a Holmes movie? The plot wasn't anything too brilliant, but it was good enough. 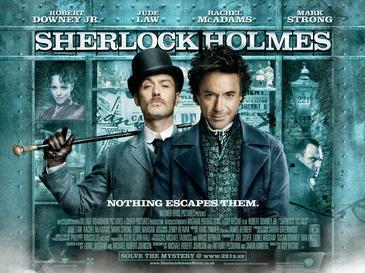 The best reason to watch is the interaction between Holmes (Robert Downey, Jr.) and Watson (Jude Law). They worked well together, and the best scenes were the ones when they were bickering. Also, I enjoyed all scenes when Holmes is one step ahead of everyone else. He notices these minor details (a bit of chalk on the lapel, meaning someone is a professor) and plans out the entire scene before he says a word. I was thinking about this in one scene when Holmes then states that he has a question. I immediately thought that it was out of character, and that he wouldn't need to ask a question in this scene. It turned out the be a rhetorical question showing again that he was several steps ahead of everyone. It was these little things that showed me that the people making the movie understood the character. They knew what was important about Holmes. So if they want to update him a bit with some action? I was OK with it. Lancey Kisses said it this way: "Was it amazing, fantastic, and groundbreaking? No. However, it was thoroughly entertaining and a lot of fun, which is what I think it was going for in the first place." My question is - will kids who go see it want to read Sherlock Holmes, and if they do, is it similar enough so that they like it? I'll be curious to see how many kids even went to see it (I saw a couple Facebook posts, but not too many). If we had a real library at school, I'd be curious if anyone would search for Holmes books. I, too, read that Stephen King short story. I, too, cannot remember which collection it's from, although I know it's one of the more recent ones. I, too, am unable to recall if I liked it or not. Kids who are inclined to read will read one way or another. Even if the film was 100$ accurate to the original stories, the kids who don't read would say, "Why would I want to read it? I can just watch the movie."